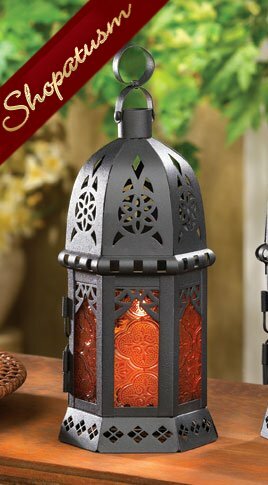 This is for a wholesale bulk lot of 10 amber glass Moroccan candle lanterns centerpieces from Shopatusm. Crafted in metal with amber stained (translucent) glass panels. Hinged door swings open to place a candle inside. For tea light or votive candles (not included). Great for indoor or outdoor. Each: 4 1/8 inch x 3 3/8 inch x 10 1/4 inch high.